Carve the canyons on your Concours, fly in on your FJR, ride the sweepers on your ST or blast in on your Beemer. 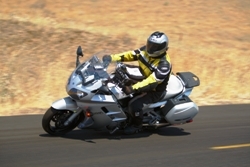 Sport Touring Northwest is the West Coast's premier multi-day, non-brand-specific sport touring rally open to ALL riders of ANY brand of sport touring bikes. Take in clinics with top name speakers, experience the scenic beauty of the Columbia River Gorge, ride hundreds of miles of serpentine roads and enjoy five days and four nights of too much fun. The setting is like no other. Nestled in the Columbia River Gorge (along the Columbia River on the border of Washington and Oregon) you'll experience a broad range of terrain, unique geological features and scenic vistas. Ride hundreds of miles of fantastic roads and experience the magic that is the Gorge. Each year we feature an impressive collective of guest speakers, clinics and seminars. Improve your GPS skills, get inspired by our travel speakers and learn tips and tricks for long range riding. The rally is held at the Hood River County Fairgrounds in Odell, Oregon. The fairgrounds feature all the facilities to make your experience a pleasant one, including fully equipped restrooms, hot showers, a spacious tent camping area with electricity and water, and RV hookups (small extra charge). Throughout your four day experience you'll enjoy the company of other sport touring enthusiasts, share your knowledge and gain from theirs, meet new riders and leave wanting more. Relax during our evening programs which include a silent auction, informative travel presentations, movies, door prize giveaways, fireside chats and more. While many rallies boast stunning scenery, this one truly provides it mile after mile. The Columbia River Gorge is a designated National Scenic Area, one of the few in the United States. Take a look at the video and you'll see why this is truly one of the most beautiful places for riding motorcycles in North America. We've got a top box full of great seminars and clinics lined up to provide you plenty of info to better your riding skills. Check the schedule as it evolves to stay on top of who will be there. The beauty of the Columbia River Gorge is enhanced by the fact that it boasts hundreds of miles of twisties. It's not possible to ride all the great roads here in a single rally, so our suggested rides change from year to year. All attendees get free ride maps complete with turn-by-turn directions and riding skills tips. Optional MapSource GPS files are available for download once you arrive. Once you arrive at the rally, you can download all the recommended rides at our registration table. 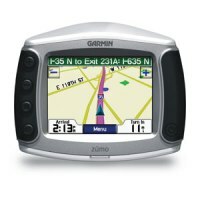 Our GPS files are in MapSource format, but if you need them for other than a Garmin unit, we can provide you a GPX file to do your own conversion. 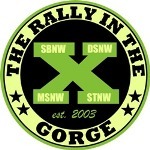 Sport Touring Northwest was added to the Rally in the Gorge lineup in 2006. The Columbia River Gorge is one of only several places on the list of US National Scenic Areas. Clement Salvadori was a featured presenter at the 2011 and 2015 rallies. Canadians make up 10% of the attendees at the rally. In November 2011 Sound RIDER! was honored with the AMA Road Event Promoter of the year award during its celebration of Champions awards event in Las Vegas. Can't make the rally, but you'd like to donate door prizes or auction items. Call Connie at 206-898-7687 for more details.